Do you have doubts around wearing dentures? The good news is that denture adhesives, also known as denture fixatives, can keep your dentures securely in place. Polident 3D Hold Denture Adhesive gives extra grip (vs. no adhesive) when applied so you can eat, talk and enjoy physical activities with confidence. Apply Polident adhesive once a day in short strips, not too close to denture edges. Press dentures into place then hold firmly and bite down for a few seconds to secure hold. Swish mouth with warm water, then slowly remove denture. Wearing a denture is never easy. Want to have a carefree denture care experience? Try Polident Denture Adhesive Cream! 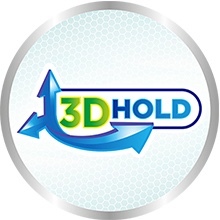 It holds your dentures in 3D: forwards and backwards, up and down, and side to side so you can be worry free all day long. Choose Polident Denture Adhesive Cream for a strong, all-day hold! Polident Denture Adhesive Cream has been demonstrated to provide the benefits of all-day hold and to seal out food particles. 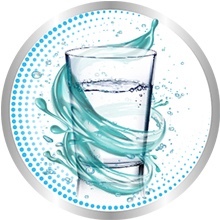 It hydrates to form a physical barrier between the gum and the denture surface. 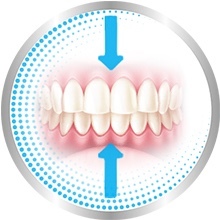 This physical barrier serves to help seal out food particles from getting trapped between the gums and the denture. Spaces between the denture and gums are reduced, giving you greater confidence to bite harder. 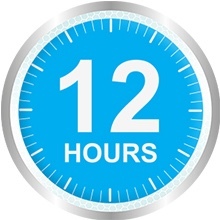 Our formulation provides an effective all-day hold for well-fitting dentures and partial dentures (up to 12 hours). Polident is formulated to improve the comfort and oral hygiene of those who wear full or partial dentures as part of an oral care routine. 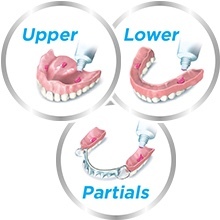 Looking for an optimal denture and partial denture care experience? Try our low-abrasive denture cleansers which are formulated specifically to keep your dentures clean and fresh. Not having to worry about your dentures or partial dentures (commonly called false teeth) sitting tight leaves you free to deal with the more important things in life. If you’re after strong all-day hold with a natural feel, look no further. Polident Denture Adhesive Cream gives you 3D hold, and is free from zinc. 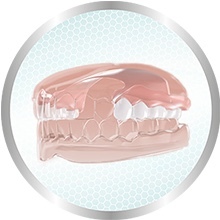 How about also trying Polident Denture Cleanser? 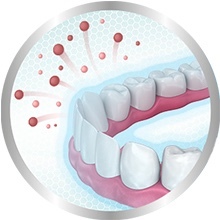 It kills 99.9%**of odour causing bacteria for a cleaner, fresher and brighter denture, including partial dentures. Keep out of sight and reach of children. A few individuals may be sensitive or allergic to this product. If you experience an allergic reaction or discomfort, discontinue use immediately. Swallowing small amounts of this products, when used as directed, may occur and it is not harmful. Ill-fitting dentures may impair your health. Visit your dentist regularly to check your denture fit. To keep tip from clogging, keep cap and nozzle dry. Calcium/ Sodium PVM/MA Copolymer, Petrolatum, Cellulose Gum, Mineral Oil. Does not contain Zinc. For the first time, use a small amount, too much can cause oozing; apply less next time if this occurs. It may take a few tries to find the right amount fo your denture. Apply once a day for secure hold. If you need to apply more than once a day, seek advice from your dental care professional. 1. Apply Polident once a day to clean dry dentures, in short strips as shown, not too close to denture edges. 2. Rinse mouth before inserting dentures, press dentures into place, hold firmly & bite down for a few seconds to secure hold. 1. Swish mouth with warm water, then slowly remove denture using a rocking motion. 2. Remove adhesive residue from denture and mouth with warm water & soft brush. 3. Use Polident Cleanser to thoroughly clean your denture & then rinse with water. 1. Apply Polident Denture Adhesive Cream once a day to clean, dry dentures, in short strips as indicated on back of pack, not too close to denture edges. 2. Rinse mouth before inserting denture (or partial denture), press dentures into place, hold firmly and bite down for a few seconds to secure hold. 2. Remove adhesive residue from denture and mouth with warm water and soft brush. 3. 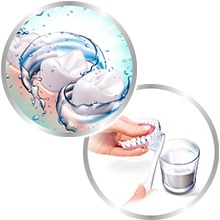 Use Polident Cleanser to thoroughly clean your denture and then rinse with water. For the first time, use a small amount - too much can cause oozing. Apply less next time if this occurs. It may take a few tries to find the right amount for your denture. Apply once a day for secure hold. If you need to apply more than once a day, seek advice from your dental care professional. You should always follow label use instructions and use the smallest amount necessary to get the desired benefit. Applied once a day as per usage instructions it has been shown to provide all-day hold (up to 12 hours). 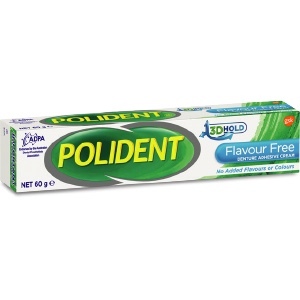 Polident Denture Adhesive Cream Flavour Free 60g is rated 5.0 out of 5 by 3. Rated 5 out of 5 by naturegirl from Great applicator I bought this online and although trying many different products on the market I find Polident adhesive the most reliable product. Easy to clean after wearing, and once applied I don't feel embarrassed to eat any food as I feel safe in the knowledge that Polident adhesive won't let me down. Rated 5 out of 5 by Horst from This Denture Adhesive is great and allows me to keep my lower dentures in and be finally allowed to eat everything.